Sherman First Selectman Don Lowe stands with new curve signs that were installed on Wakeman Hill Road on Jan. 25 in Sherman. An abundance of curve warning signs were installed as part of a federal grant. 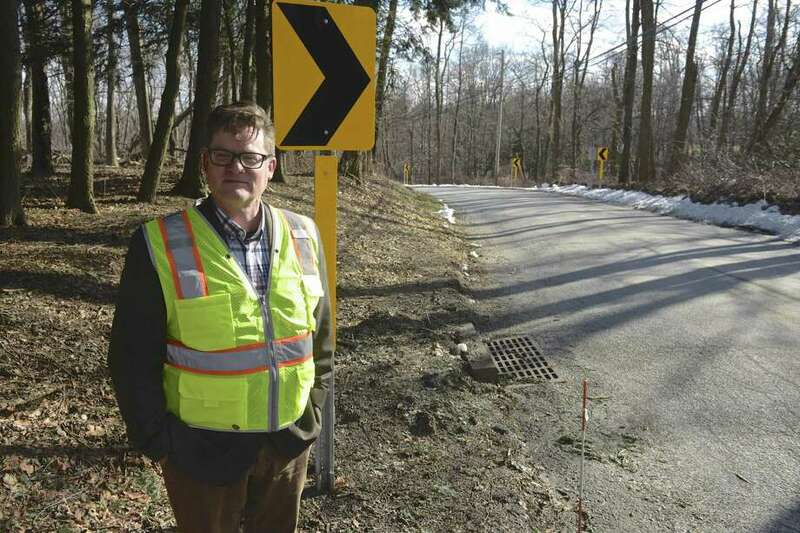 Sherman First Selectman Don Lowe eased his car around Wakeman Hill Road, counting the chevron road signs on the back-to-back curves. There are 68 signs spread out over a mile of the road, marking curves in each direction as part of a new federal program to make rural roads safer. The signs were installed just before the new year in many towns across the state with a $3.84 million federal grant. But it seems no one expected there to be quite so many. Officials in Sherman, New Milford and Ridgefield are now trying to remove some of them, saying the number is excessive, especially in the bucolic areas. In New Milford there were 339 signs installed on 14 roads and Ridgefield now has 86 signs on two roads. Although many residents and officials agree it’s a good idea to make drivers aware of the curves, they have said there are just too many signs and some question whether some of the curves are sharp enough to warrant them. “It’s really ruined the road,” Lowe said, comparing the road to one found in a video game instead of a scenic part of Sherman. A state Department of Transportation spokesman said they worked with the towns to create the plans and the signs help make dangerous roads safer. Connecticut had 37 fatal crashes on rural roads in 2016, with more than half of them coming from people driving off the road. The amount of accidents that happen on curves is overrepresented, said DOT spokesman Kevin Nursick. District 4, which covers northwestern Connecticut, received nearly $782,000 to install signs in 19 towns, including Bethel, Danbury, New Milford, Newtown, Sherman and Ridgefield. Towns opted to join the program and then sent a list of local roads that could use safety improvements to the state for approval. A plan was then created for the roads that were considered dangerous based on the amount of treatments the town was comfortable with, such as markings on the road, approaching arrow signs and chevron signs for the curves, Nursick said. The plans took numerous aspects into consideration, including the sharpness of the curve, shoulder width, where a car would go if it goes off the road, sight lines and the speed limit. Town officials then signed off on these, which is why Nursick said he’s surprised by the backlash. In both New Milford and Sherman, though, the current chief executives inherited the projects from their predecessors, although neither town official placed any blame on the previous administration. George Kain, Ridgefield’s police commissioner, surmised that the disconnect where the decision makers remained in place could simply be because the towns didn’t realize the full extent of the project. He said the Ridgefield Police Commission agreed to the plan in 2017 when they were told a “high visibility sign” would be erected. He said they were unaware of the chevron signs until they were installed in December. “I have personally viewed the signage on both roads and find it to be excessive,” Kain said. Maria Ferreira, a resident who has lived on Long Ridge Road in Danbury for 34 years, said she feels less safe driving on the road because of how reflective the signs are in the dark. Her relative up the street, who is in her 80s, said all of the signs confuse her. “It’s like there are lights on the road,” she said. She said there are some curves that need them, but it was a waste of money to put these signs here. New Milford Mayor Pete Bass agreed, pointing to Bear Hill Road as an example. Both Lowe and Bass said they didn’t know of serious accidents on these roads prior to the signs. But Nursick called the project a preventative measure so that serious accidents don’t happen. He also said there is no data that shows the retro-reflexive signs are more dangerous. They actually make the roads safer because they allow you to see the curve at night, he said. He compared it to getting a flu shot or vaccine to prevent an illness. Some towns are looking at ways to reduce the number of signs. Ridgefield, Sherman and New Milford are all considering reducing the speed limit in certain spots that would allow them to take some of the signs down. Kain said they are working with the state and the town’s attorneys to determine what can be done. Any changes will have to wait until the spring when the project is completed. Nursick said there is some flexibility to reduce the number of signs and the state is working with the towns on it. “We’ll be as flexible as we can to a certain point,” he said. He said it’s important to remember that the signs might seem excessive to a local who drives those roads every day but are needed and appropriate for someone new to the area or a new driver. He said the signs might be especially helpful for those drivers in poor weather and visibility conditions.